There is a new spam campaign targeting Scandinavians and it’s spreading as you’re reading this. This is the fourth major ransomware campaign we’ve reported since the beginning of September, and what is worrisome is the fact that detection rates have remained very, very low. Following the crippling effects of this last campaign, another spam run delivering ransomware has emerged. Heimdal Security has collected and analyzed the information pertaining to this new attack, which is less sophisticated, but no less dangerous than the previous. The current spam campaign is spreading ransomware by sending a spam email to arbitrary recipients with an attached Word document. That document contains macros, which, when activated, will download and run the malicious ransomware. In order to decrypt the files and regain access to the data, the victim must first communicate with two different Gmail accounts and pay the ransom. 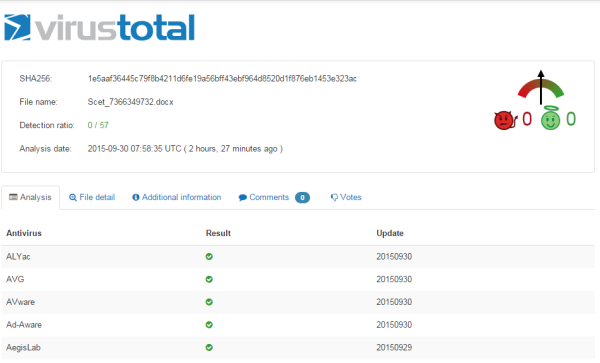 Click here for the full VirusTotal page detection rates at the moment when the campaign was discovered. Are you vulnerable to ransomware attacks? Do you have the latest Windows updates installed? Is every single software app you use up to date? Are you able to detect dangerous web destinations when you go online? Do you have a multi-layered security system in place to protect your data? If the answer to at least one of these questions is “no”, then you are exposed to becoming a Cryptoware attack victim. And these are just the basic security measures you should follow every single day. But very few people do, unfortunately. For example, let’s look at some key figures. Outdated browsers are some of the most used attack angles that cyber criminals employ in their campaigns. So things become quite risky when millions of users choose or are forced by their employers to use versions of IE, Firefox or Chrome which are not up to date. Internet Explorer 7, 8, 9 and 10 users account for 2,7% of the entire IE usage across the world. That would mean approximately 8,6 million users (a figured estimated based on the current number of Internet users in the world – 3,2 billion). Firefox users aren’t doing a better job at staying up to date either, with 20,5% still using Firefox versions 33 through 40 (the latest version being 42) or older. Even Chrome users are exposed, although Google introduced the auto update feature more than a while ago. More than half (63,4%) of the most popular browser’s users are still running older versions, from Chrome 39 to Chrome 45 or older. 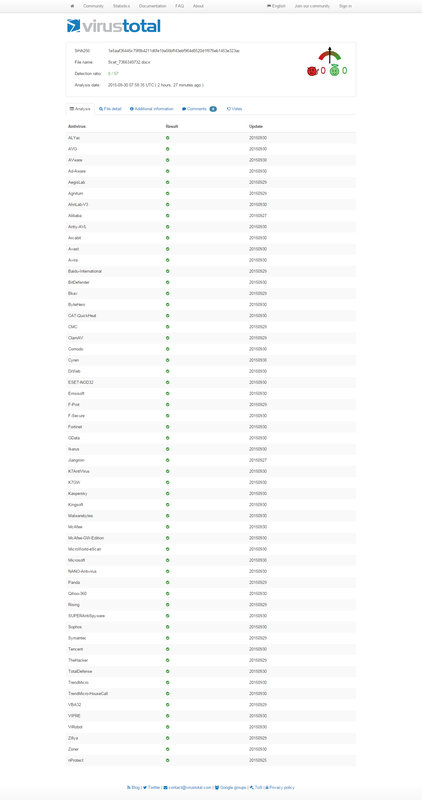 Only 0,6% of them actually use Chrome 46, the latest and most secure iteration of Google’s browser. Out-of-date operating systems also pose a huge threat, especially when 3,6% of Internet users worldwide still have Windows XP installed, which Microsoft cut off support for months ago. That means over 11,5 million users who are sitting ducks for any cyber criminal attempt to take advantage of them. Social engineering or manipulating the targeted victims into opening malicious emails containing infected attachments is also a big issue, and cyber criminals are very capable of tapping into this human vulnerability. This data, coupled with other vulnerable applications and the lack of cyber security education is what makes ransomware attacks so successful in attaining their malicious goals, irreversibly damaging the victim’s data. We recommend you exercise extreme caution when it comes to opening emails from unknown senders. It’s advised never to open an email from an unknown source, but, if your job entails that type of interaction, then do get additional protection and do not open attachments if they look suspicious. Also, if you are unsure of how ransomware can affect you, your loved ones or your business, please read the following guide: What is Ransomware and 9 Easy Steps to Keep Your System Protected.